Crews are working on power outages in Eastern South Dakota. UNDATED - Crews from nine electric cooperatives as well crews from at least three contractor construction companies are on their way to assist with repairs at cooperatives hardest-hit by Winter Storm Wesley. Throughout South Dakota, electric cooperative crews have been working since the storm started Wednesday at making repairs to damaged infrastructure. Bon Homme Yankton Electric Association in Tabor, S.D., will be receiving assistance from neighboring cooperatives Charles Mix Electric Association, Lake Andes, S.D., and Clay-Union Electric Corporation, Vermillion, S.D. The co-op is continuing to repair line in the Mayville area and other parts of its system. Central Electric Cooperative in Mitchell, S.D., will be receiving assistance from crews originating at Northern Electric Cooperative, Bath, S.D. ; West Central Electric Cooperative, Inc., Murdo, S.D. ; and Oahe Electric Cooperative, Blunt, S.D. Crews will arrive as road conditions allow. Central Electric has damage in six of the eight counties it serves. The cooperative has reported ice accumulations the size of pop cans and damage throughout its system. Douglas Electric Cooperative, Armour, S.D., will also get assistance from neighboring Charles Mix Electric Association, Lake Andes, S.D. Rosebud Electric Cooperative in Gregory, S.D., serving Gregory and Tripp counties in south central South Dakota, will be receiving assistance from Dupree, S.D.-based Boldt Construction in helping rebuild three-phase power lines in the Herrick, St. Charles and Fairfax areas of their system. The co-op reports that consumers in the Bonesteel area can expect to be out of power for the next few days. The co-op also indicates that Western Area Power Administration has damage to its transmission line that feeds the Bonesteel substation. Sioux Valley Energy in Colman, S.D., has damage – including 373 poles at last count – throughout the counties it serves (five in South Dakota and two in Minnesota.) The Sioux Valley Energy system covers a total of approximately 6,000 square miles and has damage in almost half of it—2,500 square miles. Crews from H-D Electric Cooperative, Clear Lake, S.D. ; Codington-Clark Electric Cooperative, Watertown, S.D. ; FEM Electric Association, Ipswich, S.D. ; and Lake Region Electric Association, Webster, S.D., are arriving Friday to assist with repairs. The co-op also has contractors from Legacy and Karian Peterson assisting with repairs. Additionally, Kingsbury Electric Cooperative, DeSmet, S.D., and Southeastern Electric Cooperative, Marion, S.D., continue to make repairs to their systems. 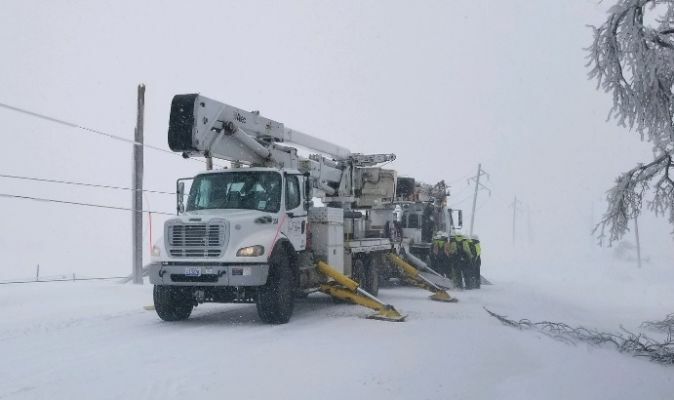 On Wednesday, Kingsbury Electric lost a couple of poles to lightning strikes before other ice and snow damage started occurring. Southeastern continues to replace more than 100 poles in its area. Progress was being hindered by muddy road conditions buried under layers of ice and snow. Line Crews continue to move in on the more heavily damaged areas in and around the north Canistota and Montrose areas. With poles and wire breaks due to excessive ice loading in those areas, plans are to make a big move with their crews in that area later today and early on Saturday, April 13, 2019. In its 5 p.m. release Thursday night, Madison, S.D.-based East River Electric Power Cooperative reported it had restored power to 22 substations that lost power due to the April blizzard. By this morning (Friday, April 12), they were down to three substations without power. Along with the substation outages, there are downed power lines on parts of the transmission system and crews are currently working to repair those structures. Consumers in the affected areas could see outages into Friday. East River Electric is the wholesale power provider to 24 distribution electric cooperatives and one municipal electric system in eastern South Dakota and western Minnesota.